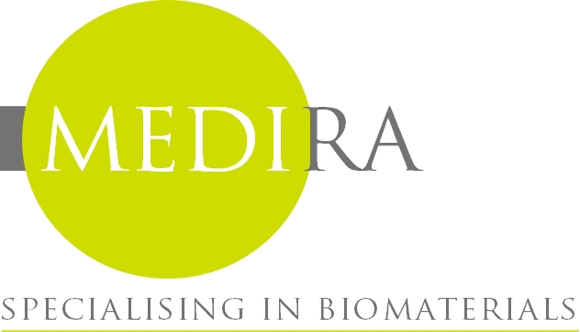 Welcome to Medira Ltd, the company that specialises in a unique range of biomaterials. Medira specialises in natural biomaterials to aid tissue regeneration. Our goal is to always provide best-of-breed products with support to the industry to ensure their correct use. We source products globally and review the research before promoting their application. We also aim to perform scientific trials in conjunction with health care professionals where the results would be useful to the medical profession. Medira is a certified ISO9001:2015 company, Our Quality Management System policy can be read here. Formed in 2008 as a consultancy, morphing into major biomaterials supplier, our team has extensive knowledge of tissue regeneration and healing and a clear understanding of the application of our products. From our head-office in Cambridge we can support the large-scale supplier and the smaller user. Medira is the home of Cellenis PRP and Cellenis PRF. Cellenis uses the latest, advanced Generation 3 gel separation technology and meets or exceeds high regulatory and manufacturing controls. PRP Platelet-Rich Plasma (PRP) is the concentration of your own body’s platelets in a small amount of plasma to aid and enhance tissue regeneration. Platelet Rich Fibroin (PRF) is a second generation preparation to create a fibrin scaffold with which the growth factors and other bioactive materials interact to stimulate the healing process. Piscean Type I collagen wound dressings and applications. Our Piscean collagen wound treatments are subjected to stringent Class III CE certification testing and controls. Medira’s collagen treatments facilitate healing by interacting directly with the cellular activities that occur during wound healing.